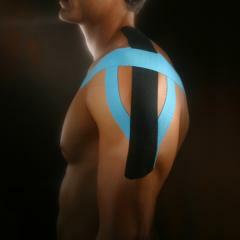 Kinesiology taping relieves pain through both physical and neurological mechanisms. The lifting action of the tape relieves pressure on pain receptors directly under the skin, allowing for quick relief from acute injuries. Chronic pain is affected through sensory stimulation of other types of nerve fibers. This is especially effective for pain that persists after an injury has healed or for pain that is out of proportion to the severity of an injury. Reduced pressure on the lymphatic drainage channels enhances the removal of fluids and other materials that collect in an injured area. This applies not only to sports injuries, but to other inflammatory conditions, including the extreme swelling of lymph-edema. Loss of strength or muscle tone can result from pain, injury or a variety of neurological or muscular disorders. In these situations, the weakness can interfere with the ability to do the exercises that are critical to recovery or improving daily functioning. Kinesiology tape not only provides support to these areas, but it can also improve neurological muscle activation, allowing therapeutic exercises to be carried out more effectively. One of the major uses in this category is with infants and young children with hypotonia, poor muscle tone that limits their ability to learn to sit up, crawl, etc. This is one of the most important benefits of kinesiology tape for competitive athletes. Injuries can be taped to relieve pain, minimize inflammation and provide support for injured structures, without compromising a healthy range of motion. Except in the case of severe injuries, this can allow athletes to continue training and/or competing as their injuries heal.